While I’m from the midwest (Illinois and Wisconsin), a large majority of my ex-husband’s family is from, and still lives in Iowa. Every year they go to the Iowa State Fair, and a few years ago we finally had the chance to join them. While there, my ex ate a sandwich from one of those fair carts called a grinder, though not too long ago they were still called “Guinea Grinders“. Guinea Grinder – why that name? Many Italians aren’t happy with the name “guinea grinder” as its origins date back to when Italian immigrants were called “guineas”. It’s considered a racial slur and some restaurants in Iowa have even changed the name of this sandwich to plain old “grinder”. The word grinder refers to the act of grinding your teeth back and fourth to bite through the tough bread in the sandwich, which would also indicate they didn’t toast them early on. No matter what you call it, it’s really delicious and freezes well too! Finding a recipe for these Grinders on the internet wasn’t as easy as searching for something more widely known. 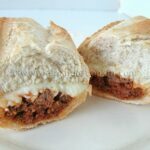 Because this sandwich is really only found in Iowa, there weren’t many search results for the recipe. There were a few different versions, but the one I chose was closest to the one my husband enjoyed at the fair. They offer it with or without Mozzarella cheese and sometimes with banana peppers. I opted for the cheese but left off the peppers to keep it family friendly for the kids. The recipe I found called for a French loaf, which is what I used here, but at the fair they used more of an bomber type bun. These were really good, easy to make, and as I mentioned, can be easily frozen. I did find that the reheated meat mixture seemed saltier after being frozen, so I would suggest adding a bit of water when warming it up the second time around. I also used shredded Mozzarella instead of sliced, which the original recipe calls for. This is definitely a great addition to my list of ground beef dinner ideas! This recipe makes 12 grinder sandwiches. I made 6 grinders and froze the other half for another meal. You could just cut this in half as well. Remove sausage casings and crumble into pan with the ground beef. Brown both meats together until no longer pink. Drain fat. Mix the salt, pepper, garlic powder and pepper flakes into the pizza sauce. Put the browned meat and the seasoned sauce into the slow cooker and stir to combine. Cover and cook on low for 4 hours or on high for 1-2 hours, stir once or twice during cooking. Preheat oven to 375 F. Cut the split French loaf into 3 separate sandwiches. Repeat with second loaf. If making all 12 servings, repeat with 3rd and 4th loaf. Pull a small amount of bread out of the bottom of the loaf to make a bowl for the meat. Fill the bowl with meat mixture. Cover the meat mixture with shredded Mozzarella cheese. Place the top of loaf onto the sandwich and wrap the entire thing in foil. Bake for 15 minutes in the oven and serve. If sausage has casings remove them and crumble into pan with the ground beef. Brown both meats together until no longer pink. Drain fat. Not only did she leave out the peppers, but she left out the onions as well. Saute both and add them in as well. Otherwise the kids will never know the flavors they are missing out on. The Best Grinders ever, were the ones sold at the Tavern in West Des Moines a.k.a. Valley Junction; back in the 1970’s. When they sold the Tavern, the Grinders were never the same, and left a lot to be desired. The food stands at the fair tried their best, but they could never get the wonderful flavors from the Original Tavern. The drive in on Hubbell in Des Moines is now called Jennie’s original Guinea Grinder now. It’s a long family recipie and I’ve been eating them for as long as I can remember but just isn’t the same as Grandmas. Love and miss you. And Amanda we may be distant cousins. But then all of us Italians are related aren’t we. Tried this recipe and it was wonderful. I made my own pizza sauce using the same spices plus fennel seed and a little sugar. The only problem I encountered was removing the sandwich from the tin foil. I might try a little Pam to counter act that. But over all, a great guinea grinder. Use Reynolds wrap non stick it is fabulous. I am making grinders tonight, yummy yum, I am from Des Moines it is wierd but I thought everyone knew what a grinder was, guess I am just an Iowa girl lol, but the Reynolds non stick works a little more expensive but worth it. I made these the other night for my wife and I. I made my own Italian bread as well. It’s apparent that no one in SC knows how to make anything other then this soft, mushy, no body, tasteless concoction that they call bread; and they can’t make a crispy crust either: Same with bagels. Yuch! Shame on you, French bread for Guinea Grinders? You’ll have to go to Confession for that. Have you ever had a “Spiedie?” Spiedies are indigenous to the Binghamton, NY, area; heavy Italian influence up there. It’s really old world Italian and was introduced to the US around the very early 1900’s. It’s usually cubed beef or lamb that is marinated for a long time in a special marinade; the pro’s marinate it for up to 2 weeks. Then it’s skewered and cooked over a charcoal fire. Some of the vendors cover the meat with smoked Provolone for the last minute. 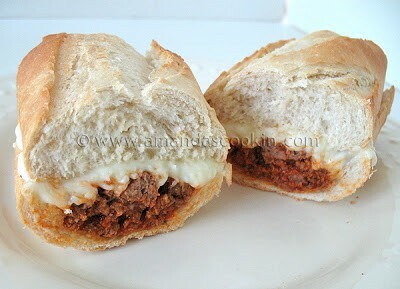 Then take a split 6”-8” Italian sub roll and use it to pull the meat off the skewers and onto the roll. Sprinkle it with some fresh marinade or Italian dressing, some Italian herbs, and you have a Spiedie. I use the sauce to marinate a lot of stuff; chicken and veggies for the grill are our favorites. We’ve found it down here, in SC, in Piggly-Wiggly, Publix and Bi-Lo. Oh my, no I’ve never had one but the way you are describing them sounds amazing! I found the site http://shop.spiedie.com and will have to try these! These are sooo good! Loved them. My boyfriend has been talking about Guinea Grinders since we met 2 years ago, and I finally made these to try them–will definitely be added to my recipe box! Thanks! I love that you call them Guinea Grinders! Grew up in Iowa and that is how I came to know them. Great recipe. Thanks David! And thanks for the reminder, I think it’s time to have these again. Amanda,I grew up in the central Iowa area,and absolutely love guinea grinders.Iowa is a pork state,they also make great tenderloins.I never had any idea what guinea meant in the name of the sandwich,so to me it is not a racial slur,some people need to not be so sensitive.Anyway thanks for the recipe,im not sure it will be the same without good Iowa Italian sausage but Im definately going to make some. My Italian barber out here in Massachusetts just mentioned “guinea grinders” to me yesterday. While the name “guinea” is a slur, I think there are a lot of Italians who jokingly use it themselves and don’t consider it particularly vile. Out here, a grinder is any sandwich made on a long loaf of bread, what is known elsewhere as a sub or hoagie. So, calling it simply a “grinder” would give no info as to what’s in the sandwich. What my barber described was a long loaf of Italian bread stuffed with salami, prosciutto, other Italian cold cuts, provolone cheese, and olive oil. Basically what I have always called an “Italian Grinder”. Anyhow, just thought I’d chime in with this regional variation on the “guinea grinder”. The above recipe sounds delicious. Thanks Tom! I think that slang changes over the years and racial slurs turn into slang. I think there are still some of the old school generation that are offended by it, but my husband is Italian and it doesn’t bother him one bit. I appreciate you stopping by! Thanks for sharing the link Fred! Hi Sally! Thanks for the comment. I have heard of a few different versions of this sandwich, they all sound delicious! yes, pretty sure that’s the one I’ve seen at the fair!